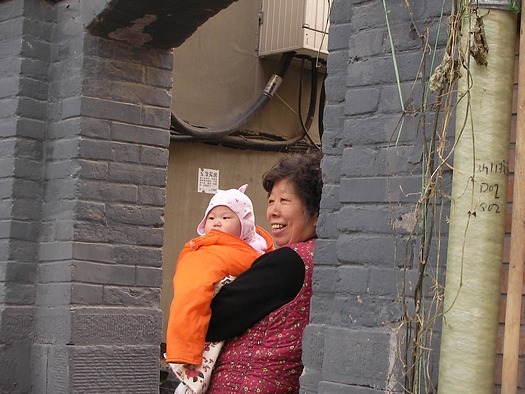 A Beijing hutong neighbourhood is home to many ordinary people of China. For them, this is not a tourist site; it's their life. You see Chinese kids playing in the streets and proud grandmothers taking care of the newest generation of Chinese people. The hutong I visited was near the Bell Tower and Drum Tower in Beijing. 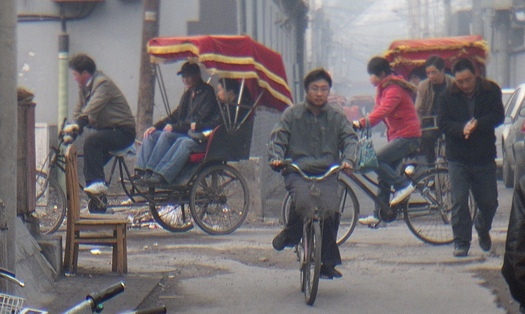 One of the things tourists often do there is take rickshaw rides through the hutong. This is not the type of rickshaw pulled by a human runner (the only place I've seen those are in Hongkong in a very touristy area) but all over China there are 3-wheel carts like these. Generally they are called "san lun che" (pronounced "san loon che" - "e" like "ou" in "could") which translates literally as "three wheel vehicle". Here you see a san lun che set up for passengers - a fancy type for tourists. In this part of Beijing these are common because it's near a tourist area and a lot of people make their living giving rickshaw rides through the hutong neighbourhoods and parks. It was a typical gray, smoggy, November day in Beijing, but everyday I saw several rickshaw tour groups like this one. Interestingly, most of the passengers were Chinese people rather than Western tourists. The most common san lun che is China's answer to the American pickup truck. It's a general delivery cart with a 1m x 1m open storage box behind the driver. You see these all over China. The people of China are endlessly inventive though, and in one Chinese city I visited, most of the san lun che had the cargo box in front of the driver. Life can be slow in hutongs. From the first time I arrived in China in 1991 I noticed that the typical people of China seemed more laid-back than I was used to in Canada. They seemed to have a lot more time to chat, even in an office situation. 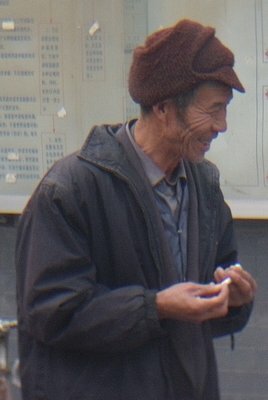 With modernization in China, that relaxed attitude has mostly disappeared for China's modern young professionals, but many, many Chinese are like this man, who had time to joke with his friends in the morning in this Beijing hutong. In the hutong nieghbourhood where I stayed, there were various restaurants for tourists mixed in with the stores for the locals. Neither type was busy, and nobody anywhere seemed to be rushing. 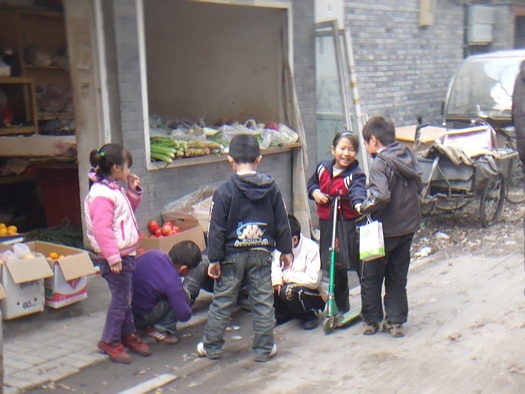 Below you see some neighbourhood kids playing in the narrow streets, which is fine since a hutong "street" is more like a back alley - almost no car or truck traffic and what does come putters along at walking pace. These kids were quite friendly. I think they're used to foreigners who don't speak Chinese, so when my wife and spoke to them in their own language they were happy to pose for pictures. This Chinese grandmother (below) was also quite friendly - and very proud of her grandchild. I spotted them just out for a bit of fresh air, standing in one of the hutong gateways. The people of China have been raised mostly by grandparents I think. 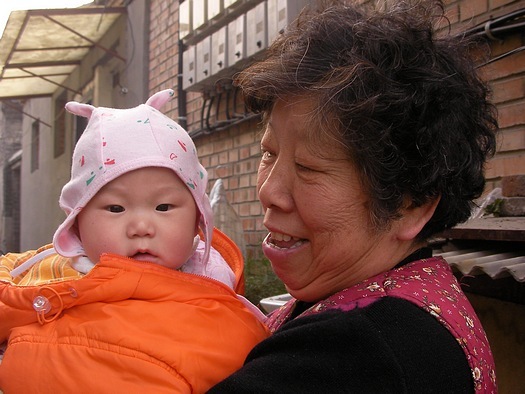 With the Chinese extended family concept you get 3 or 4 generations living together (particularly in a hutong) and it's natural that retired grandparents help out with the babies. Typically the moms have jobs outside the home and limited maternity leave. One of my former Chinese students was working in Toronto when she and her husband had a baby. She and her husband both had PhDs and good jobs, so they took their baby to China to be raised by grandparents while they continued to build their careers in Canada. Other Chinese couples in Canada have arranged for the grandparents to come to Canada to live with them so there's built-in childcare and parenthood has less effect on career. To the people of China I've met, this sort of arrangement does not seem unusual. 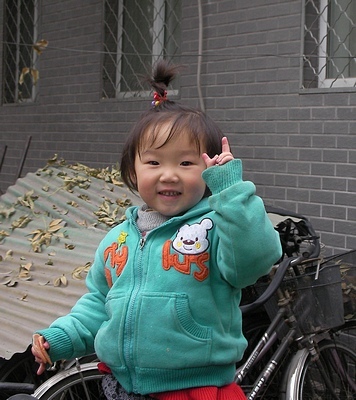 This little girl's friendly smile is a good way to end this collection of public domain photographs of the people of China in Beijing hutongs. 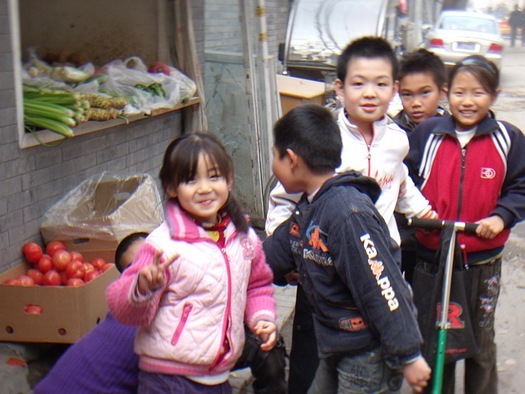 Go from People of China in Beijing hutongs to Chinese People overview page.